This doesn't look at all ancient. It supposedly dates from 120 CE? Isn't that incredible? I've been studying these portraits a lot lately, they're a really amazing combination of cultures. You mean this hasn't been retouched or updated? 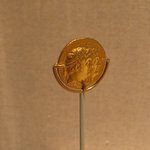 This is influenced by the Greco-Roman painting style which was seen in both Greece and Rome at the time...the amazing thing is that many of the Greek and Roman portraits from the same period didn't survive the times because these were made and kept in the dry, hot desert they've been preserved. But the colors are so rich! And his face looks so modern! I know! That's what makes these portraits so special! I believe this one is done in encaustic, is that what the label says? Yes although I don't know what that is. It's a combination of hot and cold pigmented waxes, an incredible medium to use for portraiture. And unlike Egyptian portraits made before Roman rule, these are supposed to be as close as possible to a realistic representation of the subject. 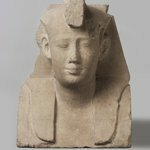 Prior to this, Egyptians were interested more in formulaic styles, or portraiture that makes the subject look more like the king or a specific god. But these are amazing...you can actually see the person in all their living, breathing form. If you look really close, you'll see that the artist uses these really fine cross-hatching movements through the wax to create depth and detail. So here's the wild part..these were often people of Greek heritage, with Greek names, who were direct descendants of the Greeks who lived in Egypt during the Ptolemaic period. But they're wearing the styles of the time popular in Rome, and belong to the elite Roman society...AND they are being buried in the traditional Egyptian way, with this portrait fitting into the linen wrappings of a mummy, so that they could have a safe and successful journey through the Egyptian afterlife. Amazing, right? Ha! And we thought we created the cultural phrase "melting pot"! Totally! 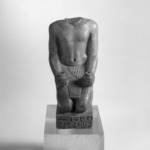 I think we tend to think of Ancient Egypt as this separate, totally insular society. 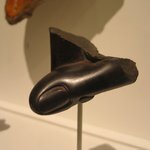 But even before the Greeks and Roman periods, the Egyptians were trading with other cultures like the Minoans and Nubians. 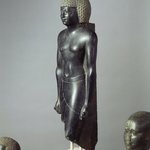 I think it's so interesting that throughout the different foreign rulers in Egypt, they didn't eradicate the traditions or beliefs but added to them. 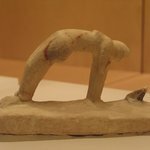 What is the difference between this & Coptic art? "Coptic" comes from the Greek word "Aigyptos" which means "Egypt." 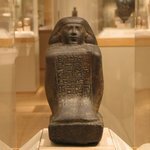 In art historical terms, "Coptic" is used to refer to Egyptian art created during the period of Roman and Byzantine occupation when Christianity was most prominent in Egypt. 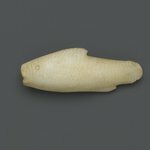 So the Coptic period itself begins later than when this piece was created; the Coptic period, according to art historians, begins around the 3rd century CE. 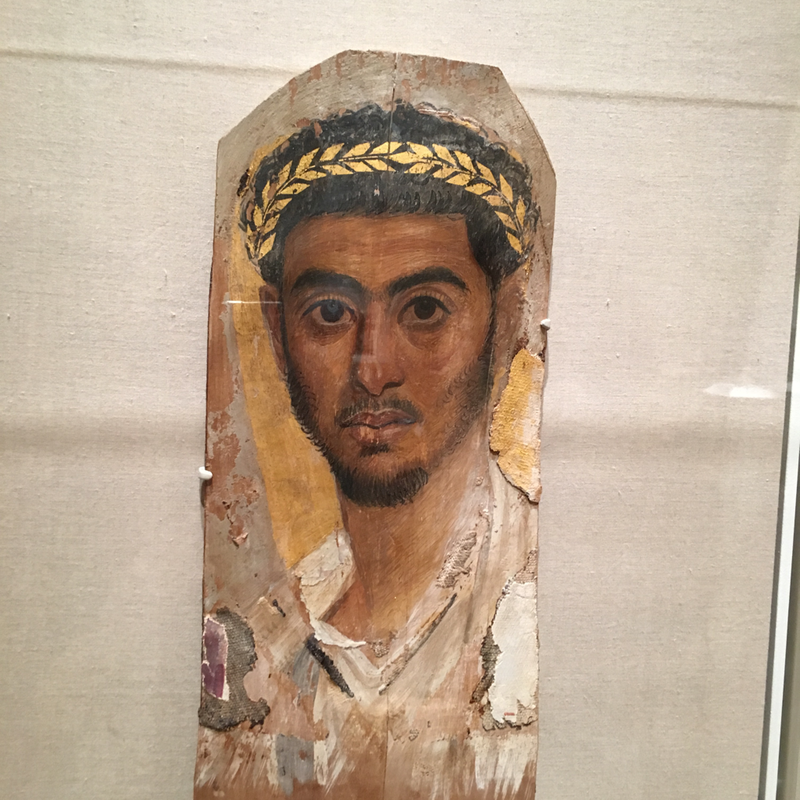 This portrait reflects the multicultural nature of Ancient Egyptian society: it was made in Egypt, during the time of Roman rule, and it likely depicts an ethnically Greek individual. Painted on wood using pigments mixed with wax, these portraits would have been attached onto the faces of human bodies that were mummified for burial in the traditional Egyptian manner. 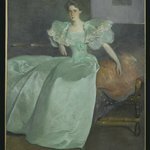 What kind of paint was used to create this portrait? It's called encaustic. 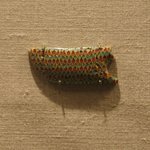 The pigment is mixed with beeswax. As you may have guessed, the painting had to be done while the wax is warm, but the result is pretty similar to oil or acrylic! 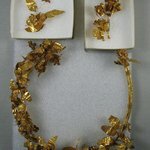 Is this an example of the Greek culture? 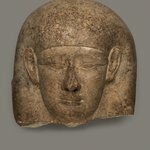 This portrait may not look Egyptian, but it's uniquely Egyptian! 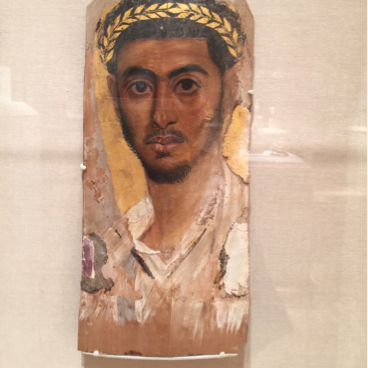 Some Egyptians living in the Roman period had portraits like this one painted to be wrapped into their mummies. 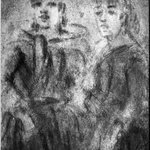 They're known as Fayum portraits (from the area in which most of them were found) and are indeed Greco-Roman in painting style and clothing. What about this painting is Roman style or is it just during the Roman time period? The realistic look of the painting with light and shadow come from the Greek and Roman traditions. The type of clothing that this man is wearing is distinctly Roman. All of these have a strong stylistic consistency. Same artist? Good eye. 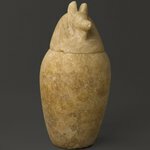 Not all by the same artist but produced during the same period and in the same region in Egyptian history, the Roman period. They reflect the multicultural nature of the society at the time. 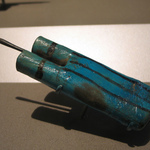 These would have been attached onto the faces of human mummies. 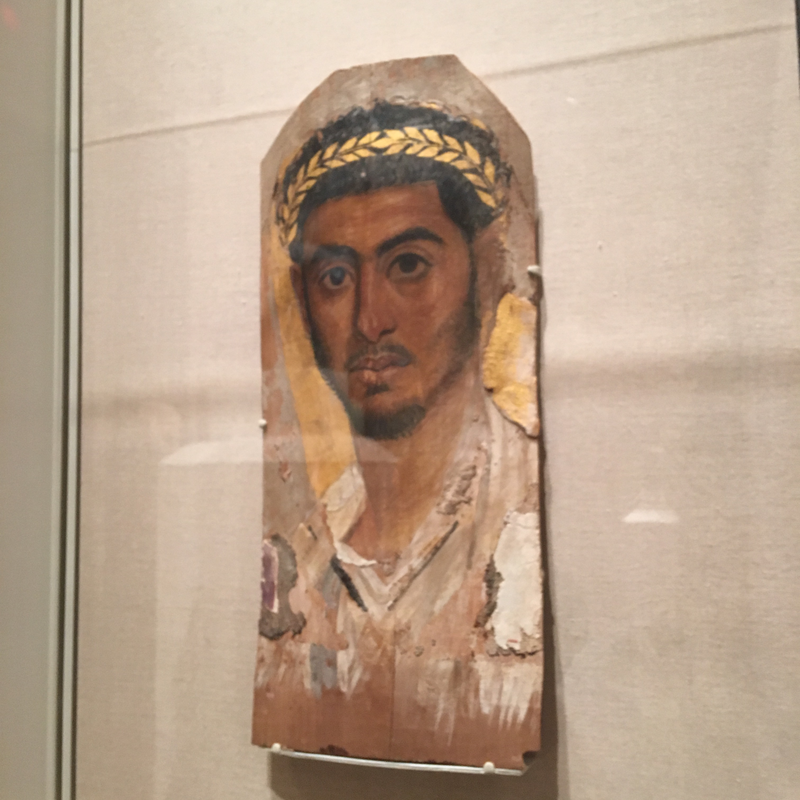 Around 900 such mummy portraits are known today and they are referred to as "Fayum portraits" Named after the Fayum Oasis south of Cairo where most of them were found. Do we know for sure different artist? Do we know names of artists or dates? 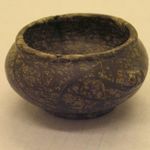 We do know for sure that they were produced by different artists because they range in date from 95 to 230 CE and were found at different sites. It's not surprising that they are similar though. 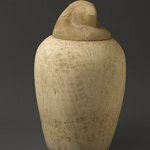 Egyptian art through time tends to follow relatively rigid iconographical schemes. These portraits were likely coming out of workshops where many artisans were trained to produce them in very similar styles. This looks super modern so it's surprising that it was done so long ago. What's his history? Is that relevant to his portrait? 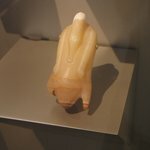 Also why did they begin to mummify Romans? It does look very modern! The encaustic paint can work a lot like oil paints. 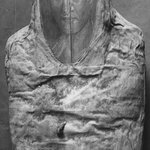 This portrait represents the blending of cultures that occurred in Roman period Egypt: though Greco-Roman in style it was designed to be inserted into the linen wrappings of this man’s mummy. We do not know this man's name or titles if he had any. That information would have been recorded on his mummy's wrappings which have been separated. 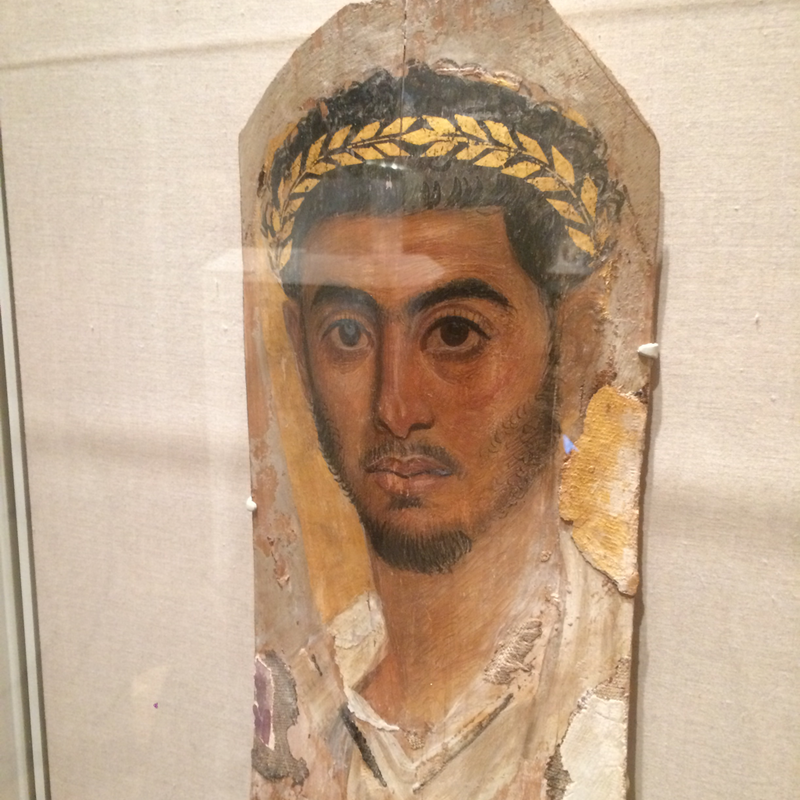 This type of portrait is known as a Fayum portrait, about 900 of them are known today. 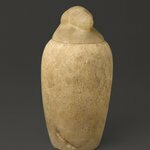 Most come from the Fayum Region in Egypt and date to the Roman period. 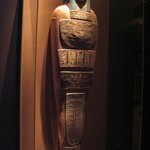 The mummification of these people seems to fall into the longstanding Egyptian tradition. 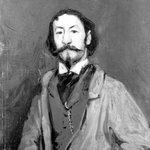 This man may have been on Greek descent, but he certainly belonged to a community established in Egypt. 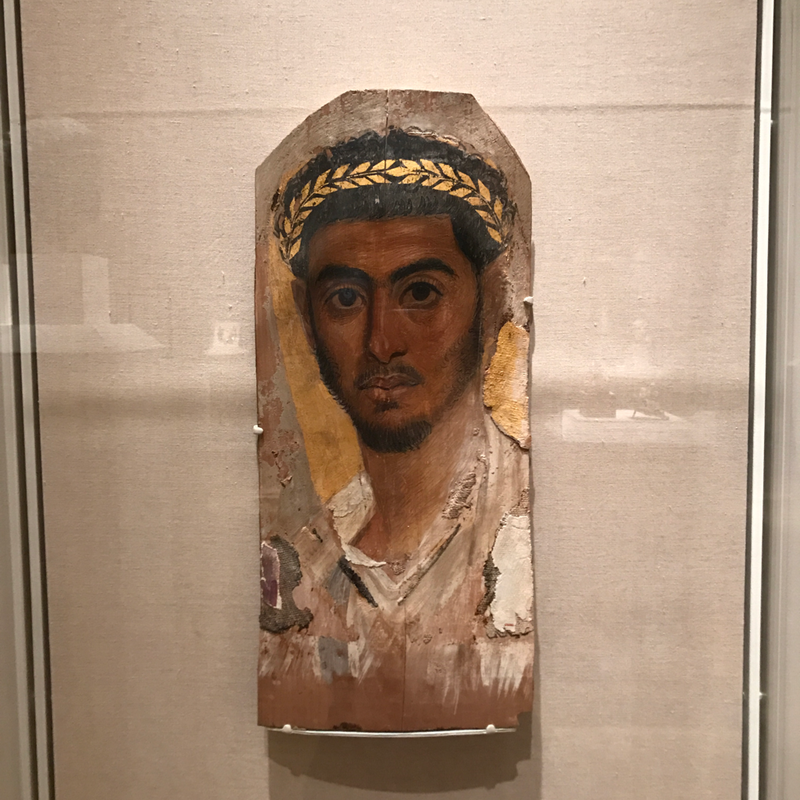 This portrait represents the blending of cultures that occurred in Roman period Egypt: though Greco-Roman in style it was designed to be inserted into the linen wrappings of this man’s mummy. 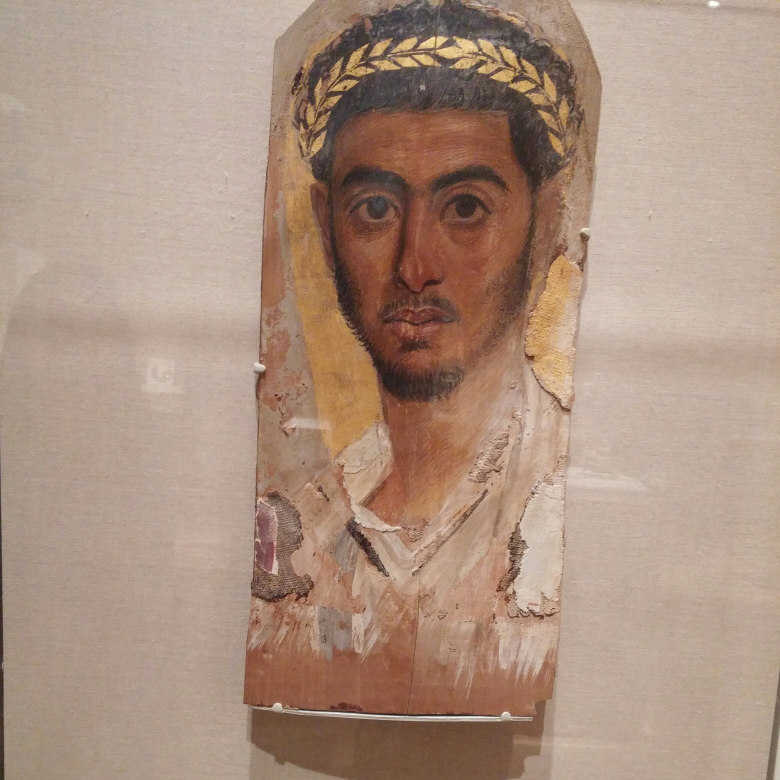 The Egyptian climate contributed to the preservation the Fayum portraits and they have become a unique window into Greco-Roman painting traditions because most examples from the Mediterranean do not survive. 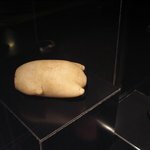 What was this man's role in the Roman Empire? Was he a government official? Why was he in Egypt and not Italy? We actually do not know this man's name or titles if he had any. 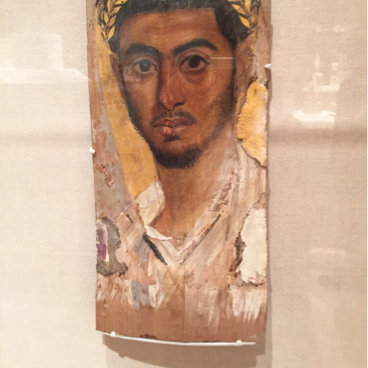 This portrait is know as a Fayum portrait meaning it was intended to be wrapped into his mummy, you can even see bits of linen still on the edges. He was in Egypt because that's where he lived. 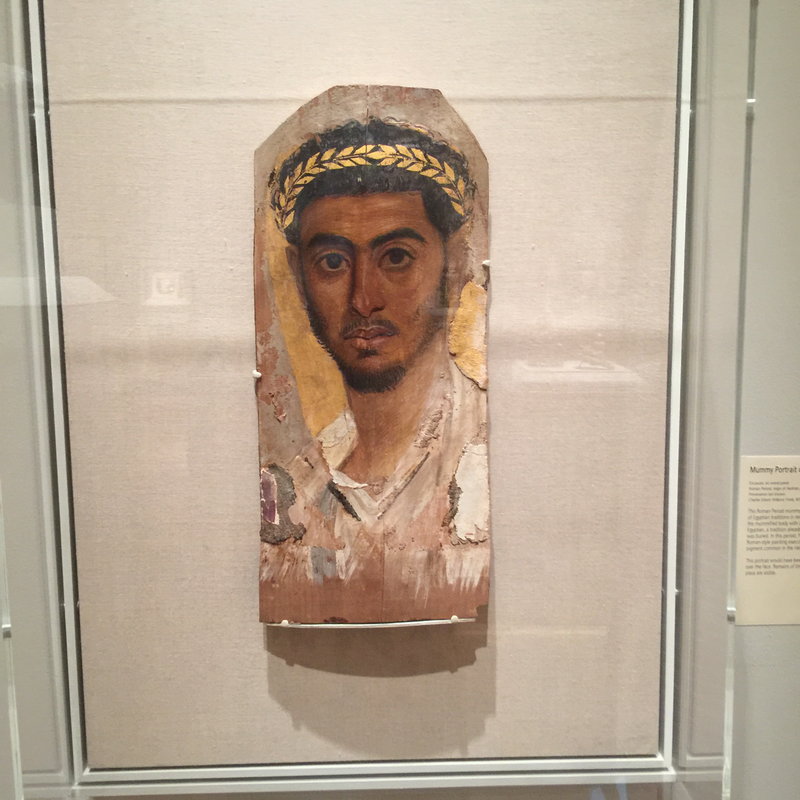 About 900 Fayum portraits are known today. 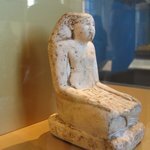 They represent the multicultural nature of Egypt in the Roman period. 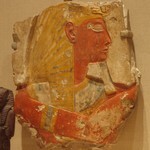 The mummification was an Egyptian tradition, but this portrait style is more Greco-Roman. 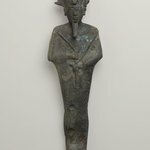 This man may have been of Greek descent, but he certainly comes from a community that was living in Egypt. We were wondering if this was a representation of the individual in his youth or if he died this young. 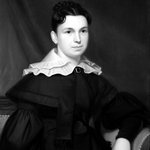 Actually, it is not known if this man died at the young age he appears to be here or if this is an idealized youthful portrait! Both approaches have are known in Fayum-type portraits, but it was most common for the portraits to represent the individual close to their age at death. 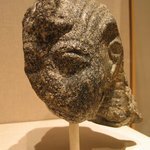 For these death masks, did they paint the deceased the way they looked when they died or was it when they looked their "best," i.e when they were younger? 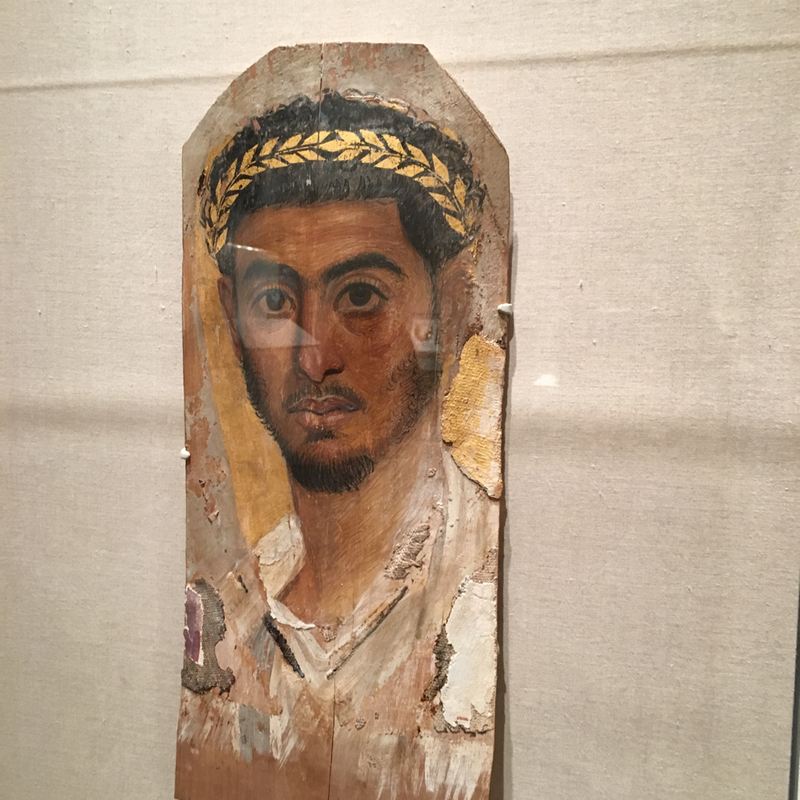 Based on analysis of mummies with these kinds of portraits it seems that sometimes the paintings showed people at their age at death and some showed them younger. 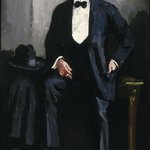 There is also some evidence that some portraits were painted when the person was younger, hung in the home, and later reused for the mummy when the person died. Who is this person? Is he an important figure? We actually don't even know his name. 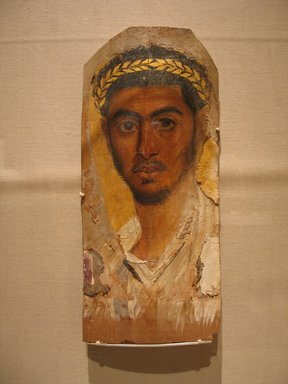 This is known as a Fayum portrait referring to the region in Egypt where most of them have been found. 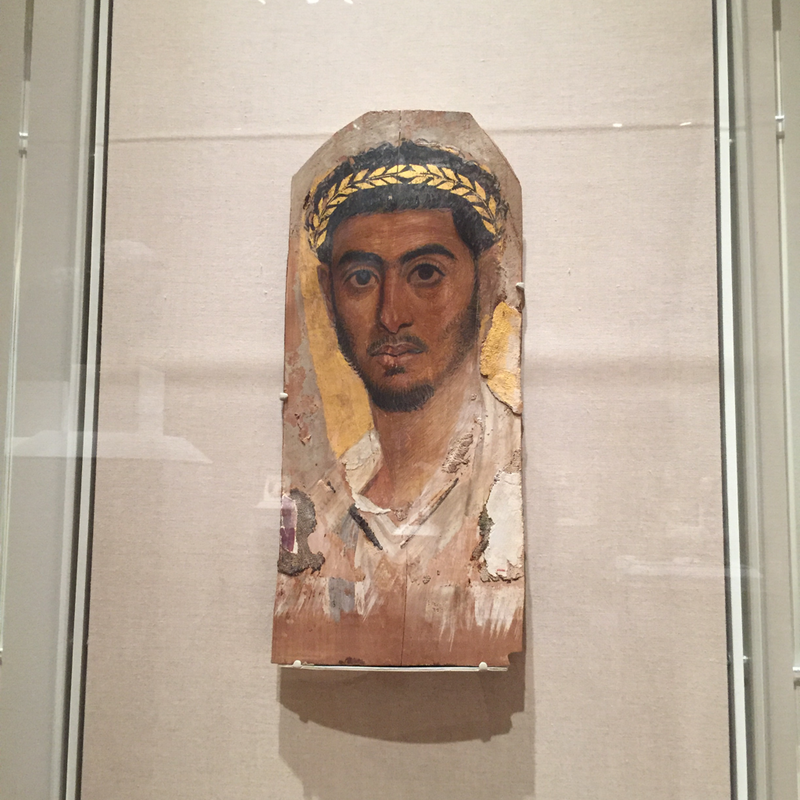 As you may have guessed from the style of the painting, this portrait comes from the period of Roman control in Egypt. If the portrait has been separated from its mummy like this one, we often have no information about their subjects. We noticed that the gold leaf is very geometric and stylized while the rest of the portrait is realistic. Why do you think that is? I believe that is a simple matter of materials. 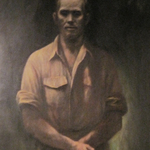 The portrait is painted with encaustic, a wax-based paint that can be used much like oil paint. The wreath, however, is gold leaf, which must be applied in a very different manner. Can you describe the encaustic process in mummy portrait of a man, please? There were a few variables, but I’ll tell you what I know! The main medium was beeswax that had been bleached through a boiling process and then mixed with egg, resin, and possibly linseed oil. 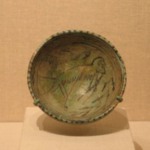 Pigments (usually mineral-based) were then added. The paint could be used hot or cold which I believe affected the blending process. Why was this portrait made? 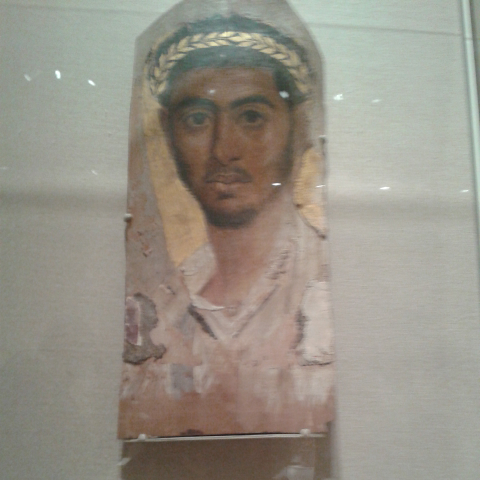 There was a tradition of including portraits like this in mummy wrappings amongst some people who lived in and around the Fayum region of Egypt. About 1000 examples are known today. 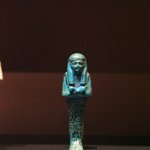 Identifying a mummy and giving the deceased a face was a practice that went back millennia in Egypt. Perhaps this different style reflects the potentially Greek background of this community. 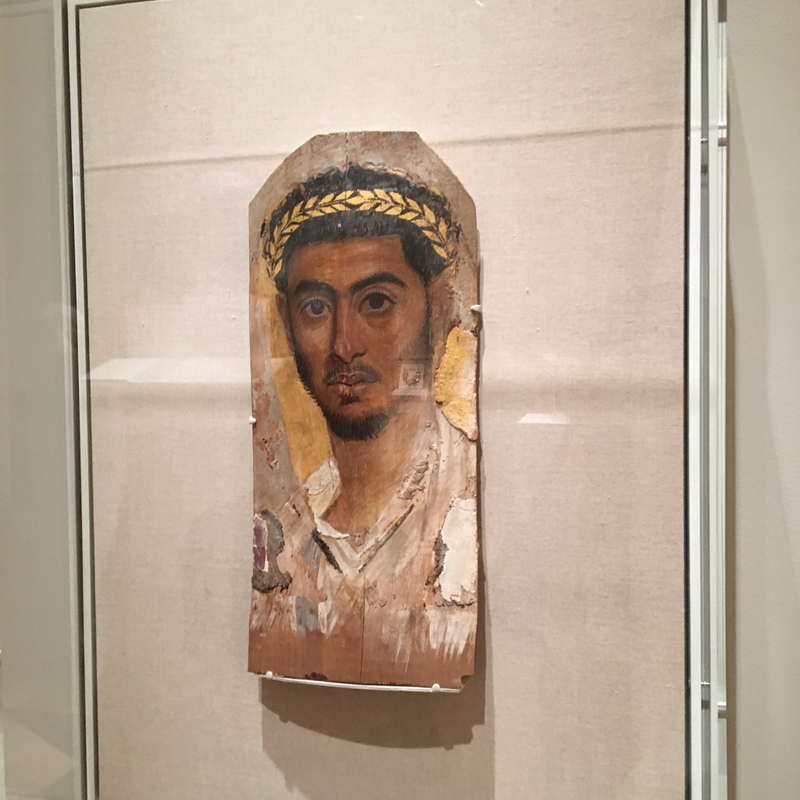 Many of the Fayum portraits that are still joined with their named mummy do have traditionally Greek names, like Demetrios nearby. Was this type of style common in its time? 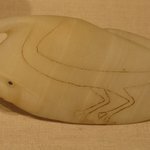 Can you tell us more about the technique they used to achieve its naturalistic appearance? The style of this portrait is Greco-Roman in origin. It began in Greece, the Romans picked it up from there, and it eventually spread to Egypt as well. It was very common in Greece and Rome and in some communities in Egypt. Rome was in control of Egypt at this time. 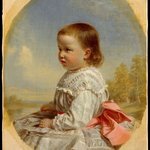 The encaustic paints, which use treated beeswax as a medium, can be used much like oil paints, so the natural appearance in the portrait was achieved much in the same way that artists create realistic portraits today. Observation would have been key in the design. 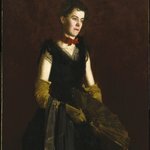 Would the portraits have been painted before the death of the subjects? We do not know when the portraits were painted. They may have been prepared ahead of time, they may have been commissioned upon death, or they may have even belonged to the deceased in life. 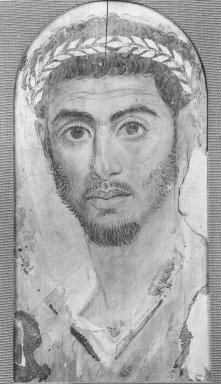 CATALOGUE DESCRIPTION Fayum portrait of a man. Encaustic. Facing front, brown eyes, black hair and beard, white tunic. Gilt wreath painted above forehead. Gilt background. Condition: Excellent. Short split at top center. Another larger one at right side. Remains of cartonnage at lower edges. Some paint missing from area around left ear. Excellent quality. Panel shows marked evidence of shrinking and crack is lengthened. Paint starting to chip.